Australia's 2016 federal election is one for the ages. With the closest result in years that will probably deliver a minority government and both Houses likely reliant on deals and haggling with the Greens, One Nation, the Jackie Lambie Network, the Nick Xenophon Team, other minor parties and independents. The election had its share of right-wing parties including the Australian Liberty Alliance and Rise Up Australia; parties whose raison d'être was nothing short of nationalistic bigotry and Islamophobia. None of these parties secured a seat in the parliament. 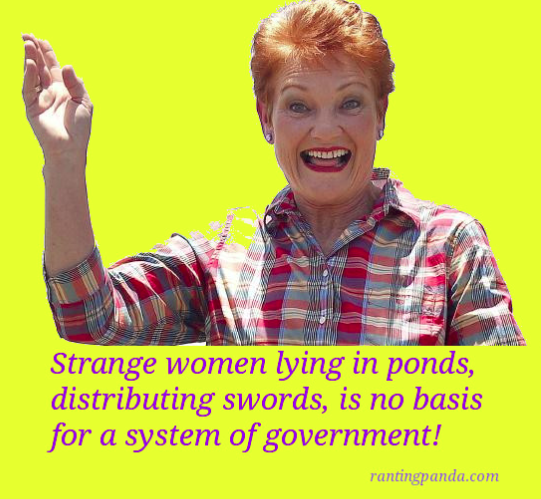 Unfortunately, the perennial Pauline Hanson appears to have successfully resurrected her old party One Nation and will likely end up with at least one, if not more, seats in the Senate. Her first post-election media conference was a rambling diatribe of insanity(1) as she unleashed a horrendous and disgraceful attack on Muslim Australians. She immediately called for the banning of halal certification, sharia law and burqas while accusing mosques of being hotbeds of hatred. She also demanded that Muslims follow the Constitution. This last accusation was a little ironic considering that Hanson's anti-Islam policies are unconstitutional. To legitimise her Islamophobia, she has called for a royal commission into whether Islam is a religion or an ideology(2). Of course, she needs it to be an ideology so that she can get around the Constitution and then try to implement her fascist and neo-Nazi policies. 'The Commonwealth shall not make any law for establishing any religion, or for imposing any religious observance, or for prohibiting the free exercise of any religion, and no religious test shall be required as a qualification for any office or public trust under the Commonwealth'. In reality, no Royal Commissioner will overturn 1400 years of history or break the news to 1.5 billion Muslims that their religion doesn't exist. Would Hanson accept the umpire's decision if the Royal Commission confirms that Islam is a religion? Anyway, many Christians go to great lengths to state that Christianity isn't a religion but a relationship. Perhaps we should remove Christianity from the list of religions. While we're at, let's remove its tax exemptions as well, but that's another story. Hanson wants the Royal Commission to investigate 'hate-preaching' in Mosques. Perhaps the Royal Commission could be expanded into hate-preaching by Hanson and One Nation. Hanson is out of control with such ludicrous fear-mongering and hatred ... and she hasn't even been sworn in yet. In fact, the dust is yet to settle on the election result. 'Strange women lying in ponds, distributing swords, is no basis for a system of government'. Hanson has made many ignorant claims, including the unfounded statement that 98% of Australians opposed halal certification. Most Aussies couldn't care less about whether food was halal certified or not. It's only the bigots that have created such a stir about it. Hanson claims that she isn't a racist. Yet she has previously attacked indigenous people, Asians and now Muslims. She recently warned that Australia risked being 'swamped by Asians'(3). Racists generalise their hatred and fear by portraying everyone in a particular people group as having the same characteristics. Hanson is doing this with Muslims, she is doing it with Asians and she has previously done it with indigenous people. If she doesn't want to be labelled a racist, then she shouldn't act like one. Another of her statements is that Muslims put God before Australia. Perhaps Hanson might want to spend some time in a fundamentalist church ... the same sort of church which is attended by many of the right-wing Christians who voted for her. Those churches put God before everything else. Yes, they'll preach that they must follow the laws of the land, just as Muslims preach. However, if push comes to shove, fundamentalist Christians will rise up against governments or laws that require them to do things that go against their beliefs. One only has to look at the passionate campaigning against marriage equality by Christian pastors who refuse to marry LGBTI people if it were ever to be made law. Hanson's racist attacks are putrid and dangerous. Australia's Race Discrimination Commissioner has warned that they are likely to incite violent hate crimes(4). Hatred and bigotry are not patriotism. Being wrapped in the Australian flag doesn't make a person patriotic. Nationalist maybe, but not patriotic. George Orwell stated that 'nationalism is power-hunger tempered by self-deception'. Pauline Hanson claims that her life is at risk because of her statements. Yet she is the biggest risk to Australia. Her dog-whistling is appealing to racists who may well feel empowered & legitimised by this hate speech. She warns of Islamic terrorism, however, counter-terrorism experts warn that right-wing extremism is as big a threat as Islamic radicalisation, if not bigger(5). If she genuinely wants to combat extremism, she should start with herself and those like her. If she wants to address Islamic extremism, then she should be inclusive not exclusive. Excluding people from society is the quickest way to alienate and radicalise them. Embracing the Muslim community and make them feel welcome and a part of Australian society is the best way to reduce radicalisation(6). This next government is going to be marred by Hanson and the bigotry of One Nation. Thankfully there are already politicians who have stated they will stand up against her hate speech. Hanson is a politician and leader of a political party, which means she and her One Nation colleagues are supposed to represent the electorate; an electorate comprised of hundreds of thousands of Australians who are Muslim or of Asian descent ... or both. If she hates Australians so much and clearly doesn't like the Australian Constitution, she can't claim to be a proud Australian defending Australian culture? She certainly isn't loyal to her country if she can't accept the demographic composition of it. At the very least she is unsuitable as a politician if she won't represent the electorate. Australia doesn't belong to white people or Christians. It is a secular nation whose Constitution protects freedom of religion. Australia is a nation built by migrants whose culture has been shaped by the cultures of other nations. Attacking and vilifying other cultures, other peoples, other religions is not patriotism, it is treachery. If Hanson doesn't love Australia, she should leave! 1. The Huffington Post, Josh Butler, 'Pauline Hanson's First Press Conference As a Senator Was INSANE', 4 July 2016, http://www.huffingtonpost.com.au/2016/07/03/pauline-hansons-first-press-conference-as-a-senator-was-insane. Accessed 5 July 2016. 2. ABC News, Kym Agius, 'Election 2016: Pauline Hanson not backing down on call for royal commission into Islam', 4 July 2016, http://www.abc.net.au/news/2016-07-04/election-2016-pauline-hanson-royal-commission-islam-banking/7566416. Accessed 5 July 2016. 3. Sydney Morning Herald, Nicole Hasham, 'Election 2016: Pauline Hanson warns of terror on the street and suburbs swamped by Asians', 4 July 2016, http://www.smh.com.au/federal-politics/federal-election-2016/election-2016-pauline-hanson-warns-of-terror-on-the-streets-and-suburbs-swamped-by-asians-20160704-gpxzpn.html. Accessed 5 July 2016. 4. ABC News, Jean Kennedy, 'Election 2016: Pauline Hanson's comments could lead to violence, Tim Soutphommasane', 5 July 2016, http://www.abc.net.au/news/2016-07-05/pauline-hanson's-comments-could-lead-to-violence:-soutphommosane/7568608. Accessed 5 July 2016. 5. Sydney Morning Herald, Rachel Olding, 'Right wing extremism equal to Muslim radicalisation, say academics', 17 July 2015, http://www.smh.com.au/national/rightwing-extremism-equal-to-muslim-radicalisation-say-academics-20150716-giduqp.html. Accessed 5 July 2016. 6. United Nations, General Assembly 86th meeting, 'Links between Extreme Poverty, Violent Extremism Can Be Broken by Creating Jobs, Reducing Inequalities, General Assembly Hears as Debate Concludes', 16 February 2016, http://www.un.org/press/en/2015/ga11761.doc.htm. Accessed 5 July 2016.